Australia is unique in that it is the home of 95% of the world’s known black opal reserves, all buried beneath the dry Outback soil in a small area of New South Wales known as Lightning Ridge. Under existing laws an individual can hold only two mining claims that measure 50 meters by 50 meters, or roughly one acre in size. These restrictions do not exist in other parts of Australia. The black opal in the Lightning Ridge area is mined in sedimentary rock dating to the Cretaceous Period, eighty to one hundred and thirty million years ago. The Lightning Ridge opal miners dig to a maximum depth of seventy feet, which has led some to ask the question: What might lie below the Cretaceous zone? In many places in Australia there exist volcanic intrusions of rock known as kimberlite that predate the Cretaceous period by millions of years. These kimberlite intrusions are sometimes the ‘host rock’ for diamonds. Could it be that if the Lightning Ridge miners dig deeper they might run into one of these pockets of kimberlite? This adventure story centers around two leading characters: Rusty, a 40-year-old opal miner, and Kate, a 60-year-old, tough-as-nails woman who raises sheep and cattle when she is not mining opal. This story, I believe, captures a sense of intrigue and calamity that continues to happen between opal miners, “ratters,” and animals of the Outback area of Lightning Ridge, Australia. 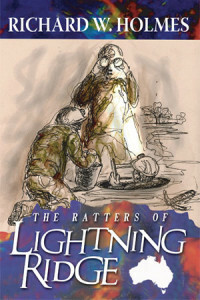 Richard W. Holmes of North (Caroline) is a frequent visitor to Lighting Ridge and has written a trilogy of short stories in the form of three books. Bryan Cook has done an imaginative job in illustrating the books in pen and ink, and his covers entice you to pick up the books and read them. I found the three books delightful to read and it answered my dilemma of what to suggest to visitors to get hold of when staying in a motel. They are a must for any tourist visiting the gem fields to get the real “flavour of the place. (Hopefully these books can still be found for sale at the Ridge motels/shops). I heartily recommend reading them in the sequence they were written, and when you have finished reading them you want Richard to put pen to paper again and write as many more credible yarns as he can come up with. His driving desire is now to have a films made on the basis of the books and with persistence he may well achieve his dream.